Join us for Family Ministry this week! We have classes for all ages. Come learn with us this week as we study Hebrews 11:1-12:2. At The Branch we believe that God has called us to live in community together. Our primary way of doing this is through our Branch Groups. If you are not currently in a group then we want to encourage you to consider checking one out. Come live life with us! For more information about times and locations email [email protected]. 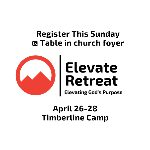 We encourage all students (6th grade through 12th grade) to sign up in the lobby for Elevate before or after Family Ministry this week. Wednesday night is the last chance to sign up. The cost for the retreat is $70. Join us on May 19th at the Brookshires Recreation Park for a great time of games, food, and fellowship with the entire church. Bring your own picnic basket of food for your family and a dessert to share with others. The church will provide bottles of water. I am pleased to announce that The Branch now has an app! This will allow us to send push notifications, announce events, and post current sermons. Please download the app here: Get The Branch App or through your cell providers app store.